​Some people might ask, “Why the great Southwest, and not just the Southwest?” Well, you see, this particular region has a ingrained interest: it is the region where my wife is from, where we got married, where my in-laws live, where I have visited hundreds of times, lived and partied for half of my life, and where I call home in France. It was the first place I visited wine and spirit domaines, the first place from where I started importing wines and spirits when I started Charles Neal Selections and, of course, the place where I researched my first spirits book called Armagnac. The first partial container of wine that I imported in 1998 held 50 cases of Côtes de Gascogne Rouge, 50 cases of Madiran, 50 cases of Cahors, 50 cases of Béarn and 100 cases of Fronton. Starting an import company with wines like these might lead some to say that I was a suicide man. But I was looking for wines that displayed character and they happened to be from the place that I knew best. And, guess what? Those wines sold and I bought more of them. Since that time I have branched out into just about every other area of France, and my initial aspirations of Madiran becoming the new Bordeaux or Jurançon becoming the Sancerre of the South have not played out the way they did in my fantasies. However, I continue to be blown away by the desire, fortitude and devotion of the producers in these areas, who daily work their unique grapes under problematic conditions that often include lots of rain and steep slopes with low yields. And then perhaps the toughest part: trying to sell them in a marketplace whose demands are for wines that are soft, round, and accessible or, at the very least, those that can be drunk without food. Well, after selling wine within the national market for over 20 years, I can attest to the fact that these wines are not the easiest to sell. Let’s face it: even experts (people who have been working retail for 20 years, MS candidates, distributors) don’t know the appellations, the grapes, or the major producers from the Southwest. And to complicate things further, the reds are hugely tannic and the whites can be very acidic. These wines are a freak show, exhibited in the Other France category like a sword-swallower or frog boy at a carnival. You see, at some point Southwestern wines will have their day, and I will continue to import and believe in them. And even if various wines from the Southwest underperform in comparison to wines from other parts of France, I refuse to give up on the region. I know that the producers that we import have unique soils, unique grapes, and a particular personality unlike others in France. They are proud of their Southwestern roots, they eat better than other parts of of the country (think duck and rich stews), they have a different accent than others in the country (more sing-songey), and they are very much part of the France profound (the deep France) where outside influences are much less apparent than in other areas. Their appellations are also less frequently visited than those in other parts of the country, which makes it easy and fun to discover your own little secrets. And that’s what makes me call it The Great Southwest rather than just The Southwest. You see, it’s a personal thing. So read on; hopefully you will be intrigued enough to purchase some of the wines, taste them in an appropriate setting and be inspired to try even more wines from this unique area that makes wines unlike any others you have had before. The Southwest or Sud-Ouest is a large wine region within the French region of Aquitaine (where Bordeaux is also located) and the Midi-Pyrénées. 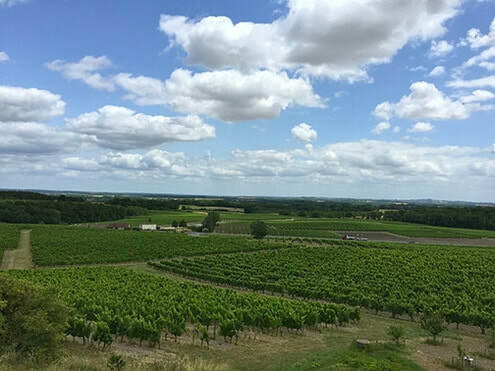 Here we find approximately 16,000 hectares (40,000 acres) of vineyards covering the upstream areas around the Dordogne and Garonne rivers, as well as Gascony and Basque Country. The geographic features of this region are highly varied—Atlantic (oceanic) influence to the west, Pyrénées (mountainous) influence to the south, and Mediterranean (temperate) influence to the east—leading to a vast array of grapes and styles, all that perfectly complement the richly decadent cuisine of the entire Southwest. The areas closest to Bordeaux produce wines of a similar style, and use similar or the same grapes, such as Cabernet Sauvignon, Cabernet Franc and Malbec. Further east, wines tend to be produced with more local grapes like Tannat, Negrette, and Fer Servadou (also known regionally as Braucol or Mansois) for the reds, and Ugni Blanc and Colombard for the whites. Meanwhile, in the areas closest to the Pyrenees the stars of the show are the white grapes Gros Manseng and Petit Manseng. 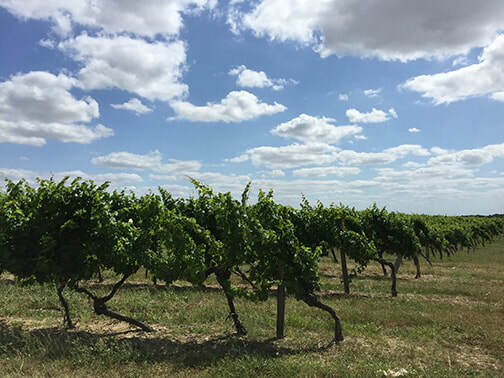 The Southwest’s more minor players include Petit Courbu, Duras, Lauzet, Loin de l'Oeil, Mauzac, Muscadelle, Ondenc, Raffiat de Moncade, Folle Blanche, Sauvignon Blanc, Sémillon, Syrah, Gamay and Chardonnay. The Cahors vineyards date back to the Roman occupation, making them (along with those of Gaillac their southeasterly neighbor) among the oldest in France. Ever since then their historical presence among the great wines of France has been noteworthy. Wines carrying the Cahors appellation must be made with at least 70% Malbec, known locally as Cot or Auxerrois. This thick-skinned, late-ripening grape produces deeply colored wines like its cousin Tannat, and so the red wines from Cahors are generally powerful and robust, with a dark purple, almost-black color. Their tannic structure can allow them to be highly ageable, and the secondary aromas and flavors that typically emerge are a pleasantly surprising result of that age. Château la Coustarelle produces around 3,000 cases a year from their old vines in Lot, and we feature the domaine’s entry level cuvée of Malbec/Merlot and their Grande Cuvée Prestige from older vine Malbec/Tannat. Wines have been made in this appellation, located several kilometers south of Bergerac, since the 14th century, and achieved particular acclaim in the 18th century when it was considered a rival to Sauternes. Due to several developments in the second half of the 20th century, the quality and reputation of the wines plummeted. But in the 21st century, thanks to more conscientious work in the vineyards and wineries, the region has returned to its former glory. The autumn mists that rise from the Dordogne River together with sunny afternoons provide ideal conditions for development of botrytis cinerea or noble rot. Soils here combine molasse (sandstone and shale) and limestone, covered with a thin layer of clay. Three types of Monbazillac exist: Classique, with about 70 grams of residual sugar per liter; Selection, with more than 85 grams of residual sugar and made from partially shriveled grapes; and the Grand Cuvées, made only in specific years from grapes almost fully affected by botrytis and with residual sugars normally higher than 150 grams. Our Monbazillac producer Domaine de l’Ancienne Cure began bottling its own wine, after mainly selling to the cooperative, in the 1980’s. Their 47 hectare property was converted to organic viticulture in 2010, not an easy endeavor on such a varied and large terrain. The clay and limestone sloped soils here are full of minerals as well as organic matter, yet with excellent drainage which forces the roots to descend deeply. We bring in the l’Abbaye cuvée of Monbazillac, made from 80% Muscadelle and 20% Semillon, whose wonderful deep golden color offers intense aromas of dried apricot, quince and vanilla. One of the lost wine regions of France, Marcillac has a totally unique landscape that all wine lovers must see to believe. While firmly located in the Southwest, its proximity to the mountainous center of France allows it to produce wines of a different profile than the neighboring AOPs. Near the end of the 18th century, there were over 4,000 hectares of vines planted here but, due to various factors, by the early 1960’s that number was down to a mere 23 hectares. Fortunately a number of surviving growers fought to keep the VDQS alive by forming a Cave Cooperative and replanting some of the abandoned terraces. Thanks to their efforts Marcillac was granted AOP status in 1990, and today the appellation boasts around 200 hectares of vines dug into south-facing hillsides (often in semi-circles or ampitheater plots) along the causse. Red wine is predominant here, and the king of the grapes is Mansois, known in other areas as Fer Servadou or Braucol. It is normally seen on its own, but up to 20% of other permitted grapes, including Cabernet Sauvignon, Cabernet Franc, Gamay, Merlot, Jurançon Noir, and the nearly extinct Mouyssaguès can be used. Mansois’ rootstock is entrenched within red clay soils (locally called rougiers) that are rich in iron oxide, with small amounts of limestone and schist--these unique soils lend Mansois its singular personality. We are happy to help keep this historically important, highly traditional wine region alive and well, and our organic producer from the region, Domaine des Costes Rouges, is fighting the good fight. We bring in their delightfully iron-influenced, intensely peppery 100% Mansois, aged only in cement tanks and bottled unfiltered. The lesser known French side of the Basque Country runs from the coastal towns of Bayonne, St-Jean-de-Luz and Hendaye inland along the Pyrénées. It has one wine appellation, Irouléguy, tucked into a mountain valley about 50km from the sea. Romans have made wine in this region since the 3rd century, but its production had steadily declined until the 1980s, when things within the appellation began to change. Terraces were carved into the side of a hillside that followed the curve of the terrain, and creating flat land between the rows allowed producers to double and triple the amount of farmable land. These terraces rise from 100-450 meters above sea level and cover a number of soil types: limestone, a sedentary rock with calcium and iron that brings roundness and elegance to the wines; orphite, a volcanic rock containing iron oxide that brings structure and power; and gres rouge, a metamorphic rock composed principally of quartz and mica, whose grapes tend to be hard, red colored and brightly acidic. Over the past couple decades vignerons have begun to plant more white grapes, notably Petit Manseng and Petit Courbu. These are used for dry white wines that are sometimes aged in older oak barrels, which normally take a number of years in bottle to show their best. Domaine Ilarria, our Irouleguy producer, brings us a deliciously rustic red of Tannat, Cabernet Sauvignon and Cabernet Franc. This little know gem of an AOP lies at the intersection of the Pyrénées-Atlantiques and the Basque country, and has a scant 259 hectares planted on mainly gravelly-clay and sandy-clay soils. Within this tiny appellation, red wines are made from Tannat and the Cabernets, and the whites from Gros and Petit Manseng. Production is dominated by the two large cooperatives, and there are only a couple of independent producers, including ours, Domaine Guilhemas (Lapeyre). We proudly bring in one of the few 100% Raffiat de Moncade wines available in the world and the only one purchasable in the United States. Undoubtedly the king of Southwest white wines, Jurançon was historically known as the noble wine of French kings. Many of the vineyards here are carved into the hillsides, creating what looks like amphitheaters curving along the slopes and giving them maximum sun exposure. Because of its higher altitude (vineyards are often at 300 to 400 meters above sea level), wines from this area tend to have the highest acidity in the region. Soils are arid, with layers of baseball-sized pudding stones embedded into the soil. These provide excellent drainage for the vines, and also help promote considerable structure and acidity. The vines usually face south and are trained six or seven feet high. As in Madiran and Iroulèguy, all grapes must be harvested by hand. Jurançon is influenced by both an oceanic climate (with some 1,200 mm of annual rain) and a mountainous climate (with warm winds from North Africa traversing the mountains during the autumn). These winds allow growers to leave fruit on the vines late in the season until it shrivels and concentrates the grapes’ sugar, creating some of the world’s finest dessert wines. 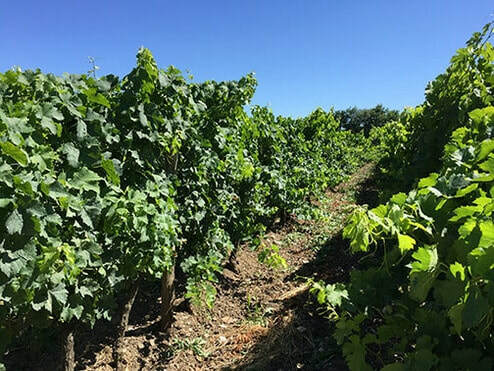 About 60% of Jurançon’s production is for sweet wines (released as Jurançon), while 40% of the grapes are vinified dry (and released as Jurançon Sec). From our highly regarded Jurançon domaine, Lapeyre, we bring in a Jurançon Sec (100% Gros Manseng) and an older vine Jurançon Sec called Vitatge Vielh (Vieilles Vignes in the local dialect), a blend of Gros and Petit Manseng and Petit Courbu. We also carry their world class sweet Jurançon, the Magendia, made with 100% Petit Manseng. Over the past thirty or so years, Madiran has garnered much worldwide acclaim, becoming known as the King of Southwest reds. When it achieved appellation status in 1948, very few producers bottled their own wines—the majority of them were sold in bulk to negociants for blending. Their deep color and dense structure added body and grip to lighter, over-cropped wines from other regions. Locals appreciated the way Madiran worked with the local cuisine that included wild pigeons, cèpes (porcini) mushroom stews and, of course, duck. The region experienced a revolution in the 1980s, when certain producers began to employ higher percentages of the local grape Tannat and managed to produce elegant wines that caught the attention of the worldwide wine press. New barrels married well with the rustic grape, giving it a flavor profile which the palate perceived as being softer, more accessible and less tannic. Clay, the major soil-type in Madiran, retains water well and provides a perfect base for rich, fleshy wines. An impenetrable subsoil called greppe (huge limestone slabs) underlies the entire region. Domaine Berthoumieu is considered a benchmark producer in the region. We are glad to bring in the 5th generation winemaker’s old vine cuvée Charles de Batz, made with mostly Tannat from 50-100 year-old vines. Once a VDP (Vin de Pays) but now an IGP (Indication Géographique Protégée), the Côtes de Gascogne is centered in the Ténarèze region of Armagnac. Thus many of the white grapes grown were traditionally used solely for the distillation of Armagnac. However, around the 1980’s certain producers began to change that by fermenting Ugni Blanc and Colombard in stainless steel at low temperatures in order to preserve their fruit and make them exuberantly aromatic. At the same time, other grapes (most notably Sauvignon Blanc, Chardonnay and Gros Manseng) were gradually planted. As the region’s reputation as a still wine producer rose, its higher permitted yields ensured that prices stayed relatively low, the perfect formula for creating some of the finest values on the market today. These include the wines from our producers: Domaine Duffour, from whom we bring in a shockingly well priced screwtop white, and Domaine Chiroulet, who gives us a few different cuvées but most notably the domaine’s old vine cuvée, Les Terres Blanches. They also make a few fun, bistro-type reds which we often bring over.